The 2015 World Vision Gift Catalog contains more than 250 poverty-fighting gifts, ranging in price from $16 to $39,000, that improve the quality of life for struggling children and families in the U.S. and around the world. This holiday season, why not purchase a hand-crafted gift for a loved one (or yourself), while at the same time help those in need? Rene received this beautiful Royal Silk Scarf (you can read her review here). 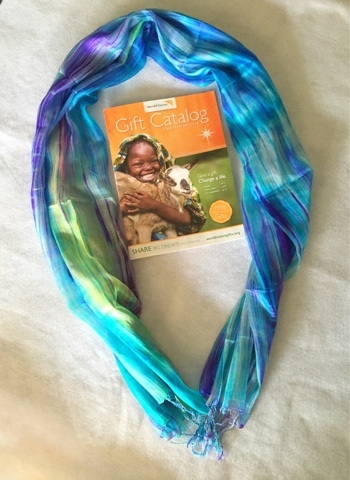 The 2015 World Gift Catalog offers many more beautiful gifts. The money raised from purchases of these hand-crafted gifts goes to the Where Most Needed fund, which supports a variety of World Vision’s programs around the world. Win: One lucky winner will receive a Royal Silk Scarf! The deadline for entries is November 6, 2015 11:59pm HST. If you submitted an eligible entry and it is chosen by random.org as the winner, you will be notified via email on or about November 7, 2015 (make sure your email address is in your profile or comment and be sure to check your junk/spam, etc. folders) and will have 3 days to respond.